"For it was indeed fitting that we should have such a high priest, holy, innocent, unstained, separated from sinners, and exalted above the heavens. 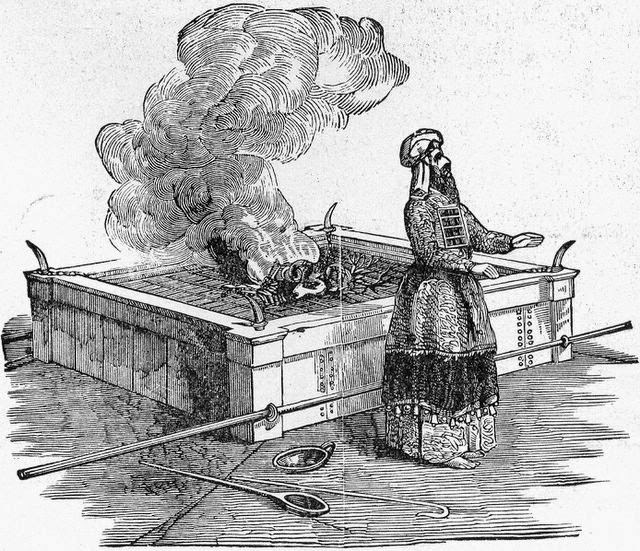 He has no need, like those high priests, to offer sacrifices daily, first for his own sins and then for those of the people, since he did this once for all when he offered up himself. ... But as it is, Christ has obtained a ministry that is as much more excellent than the old as the covenant he mediates is better, since it is enacted on better promises. ... He entered once for all into the holy places, not by means of the blood of goats and calves but by means of his own blood, thus securing an eternal redemption." I've been taking some time to create a list of top books that I feel are very valuable for Christian apologists or anyone who finds themselves defending the Christian faith—which means every Christian who takes his faith seriously today. Most of these titles have been less visible publications by known authors or books that people really haven’t heard about. So, why would I make the #1 book in my list one of the most noted titles by a well-recognized name like Dr. J.P. Moreland? Simply because Love Your God with All Your Mind actually is neglected more than many realize. As an apologist, from time to time I have had friends or church members approach me and ask what would be a good book to help them better defend their faith. Usually, this is prompted by some recent conversation where they've received some criticism on Christianity. They are usually looking for a "silver bullet" book, i.e. a single title that will address the specific issue with a quick comeback their interlocutors cannot refute. Such books do exist to some extent; Paul Copan’s True For You But Not For Me and Gleason Archer’s Encyclopedia of Bible Difficulties are immediate examples that come to mind. But I am hesitant on just tossing out a couple of titles and walking away. You see, in dealing with atheists, skeptics, and those in aberrant religious movements, one sees the scripture abused in many different ways. I am constantly confronted by arguments that use poor reasoning, passages taken out of context, or modern meanings forced onto ancient texts. Unfortunately, too many times I’ve seen Christians who try to defend their faith become guilty of these exact same abuses. Sometimes, it feels like you are giving a power tool to a toddler; while the tool is the right one for the job, in immature hands it can damage the project and possible hurt the operator! This is where Love your God with All Your Mind plays a pivotal role. The book doesn’t tell you what to say, but it helps you better understand the fact that Christianity has always been a faith of the intellect as much as one of the heart. It doesn’t teach you apologetics as much as it teaches you that a disciplined, thoughtful approach to how we develop our intellect is as much an act of worship as raising our hands on Sunday morning or dropping money in a plate. The book is clear and accessible. It’s not overly large. J.P.’s chapters include titles such as “The Mind’s Role in Spiritual Formation”, “Harassing the Hobgoblins of the Christian Mind”, and “Clearing the Cobwebs from My Mental Attic”. Each chapter helps take the man or woman in the pew from being a passive or even anti-intellectual Christian to a mature and thoughtful believer. J.P. shows how Jesus Himself modeled a strong intellectual capacity when dealing with questions from the Pharisees or Sadducees. He notes that charges of faith and reason being opposed to one another are actually lies that the enemies of Christianity promulgated. Somehow the church swallowed these lies and now believes that faith and reason live in separate spheres. With no intellectual stimulation or the ability of even their pastors to take on the difficult objections so common today, it’s no wonder that kids going off to college quickly drop out of church for what they see as a more satisfying combination of secular scholarship and morally loose living. NavPress has this month released a completely new edition of the book for its fifteenth anniversary, and it has been revised and expanded with a lot of new content. Specifically, chapters seven through nine have been completely replaced. They now contain a more direct apologetics message and present J.P.’s case for the existence of God and why the New Testament accounts of Jesus’ ministry, message, and resurrection are reliable. On top of that, J.P. and Joseph Gorra have produced a great study guide to accompany the book that can be downloaded from J.P.’s web site for free. I think that Love your God with All Your Mind needs to be read by every Christian. The challenges believers will face will not be easier in the future. In fact, given the popularity of books by the New Atheists as well as the more prominent chatter found on the Internet and social media, Christians are being pressed harder for real answers for their faith. That is why I usually put it on the top three books that I would recommend to any Christian. The Christian mind affects all aspects of Christian life, and the modern church has by and large abandoned its responsibility for nurturing that mind to maturity. If you are only going to own one book from this list, this is the one to buy. If you are involved in apologetics at your church, create a study group to go over its content with others. You should recommend it to everyone and anyone. Christians needs to reclaim the mind as a necessary part of worshipping and loving God. In so doing, they will strengthen their evangelism, their youth ministries, and their own ability to withstand the fiery darts of the evil one. 1. Machen, John Gresham. What Is Christianity? Grand Rapids: Eerdman's, 1951. 162. 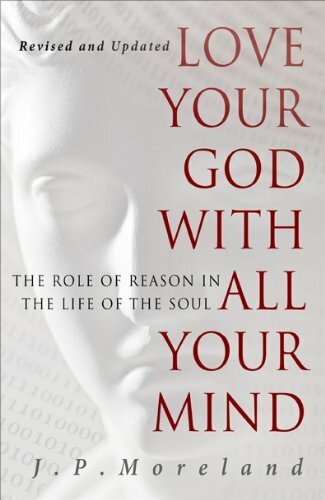 As cited from Moreland, J.P. Love Your God with All Your Mind. Colorado Springs: Nav Press, 1997. 63. Evolution is always a hot topic in apologetics circles and I've seen a true renaissance in the way Christians have approached the myriad of issues surrounding the claim that the entire diversity of life on this plant derives from a single organism plus chance mutations honed by natural selection. Such stalwarts as Phillip Johnson, Stephen Meyer, William Dembski, and Michael Behe are familiar to most who deal in this subject matter. However, in 1984 the phrase intelligent design had yet to be coined and Phillip Johnson was a full nine years away from publishing his landmark Darwin on Trial. 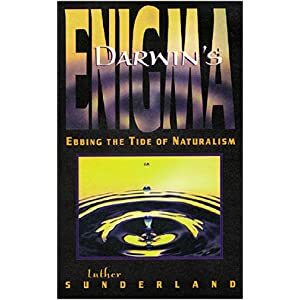 But it was this year that Darwin's Enigma by Luther Sunderland was first published, a remarkable book in many respects. This still stands as one of my favorite approaches to examining the evidence for the neo-Darwinian model that is offered as the only rational viewpoint by the scientific establishment. In December of 1978 the New York State Board of Regents directed the New York State Education Department to do a detailed study of how theories on origins should be treated in a revised version of the state's Regents Biology Syllabus. As part of their study they invited the author to supply pertinent scientific information to the Bureau of Science Education which was conducting the study. During the next year the author conducted taped interviews with officials in five natural history museums containing some of the largest fossil collections in the world. The interviews were with Dr. Colin Patterson in London; Dr. Niles Eldredge in New York City; Dr. David M. Raup in Chicago; Dr. David Pilbeam in Boston; and Dr. Donald Fisher, state paleontologist at the New York State Natural History Museum. Written transcripts of the interviews were given to the New York State Education Department for use in their study on origins. In these interviews, the paleontologists were questioned in detail about the nature of the fossil record from the deepest deposits containing fossils to the most recent. Typed transcripts of the five interviews were then sent to the interviewees for editing. All but Dr. Patterson made editorial corrections before they were published for use by educators in various states. This book presents the substance of these interviews through the use of short excerpts and summaries of the replies to the questions. Because this was well before the rise of the intelligent design movement, and because it had the auspices of the New York state educators, those interviewed seemed to be very candid in their replies. I would doubt that now, given the political heat the subject has taken on, any respondent would answer as freely as the paleontologists did here. It was truly a once-in-a-lifetime opportunity. So, what kind of information did the experts provide? One famous quote appearing in the book was given by Colin Patterson, noted paleontologist at the British Museum. In a rather excerpt from a letter, Patterson writes, "I fully agree with your comments on the lack of direct illustration of evolutionary transitions in my book. If I knew of any, fossil or living, I would certainly have included them." P atterson later summed up his statement by saying "If you ask,'What is the evidence for continuity?' you would have to say, 'There isn't any in the fossils of animals and man. The connection between them is in the mind.'" These are the true nuggets of Darwin's Enigma and they truly help people separate the conjecture of the neo-Darwinian model from the evidence that we have. 'Certainly, in the thirty five years since the original interviews were conducted more evidence has emerged. 'But although we have more fossils, we haven't found much that answers the questioned Sunderland posed any differently. No one has settled the gradualism versus punctuated equilibrium issue. Darwin's Enigma is a great read and will help you understand some of the assumptions that evolutionists make as they seek to explain the incredible variety of living entities on our planet without invoking a creator. The best part about all of this is that the entire book is available to read online for free. Rendered in html, you can access it here. 1. Sunderland, Luther D. Darwin's Enigma: Fossils and Other Problems El Cajon, CA: Master Books 1988. 89.